A journey of a thousand miles, said the Chinese philosopher Lao Tzu, begins with one step. 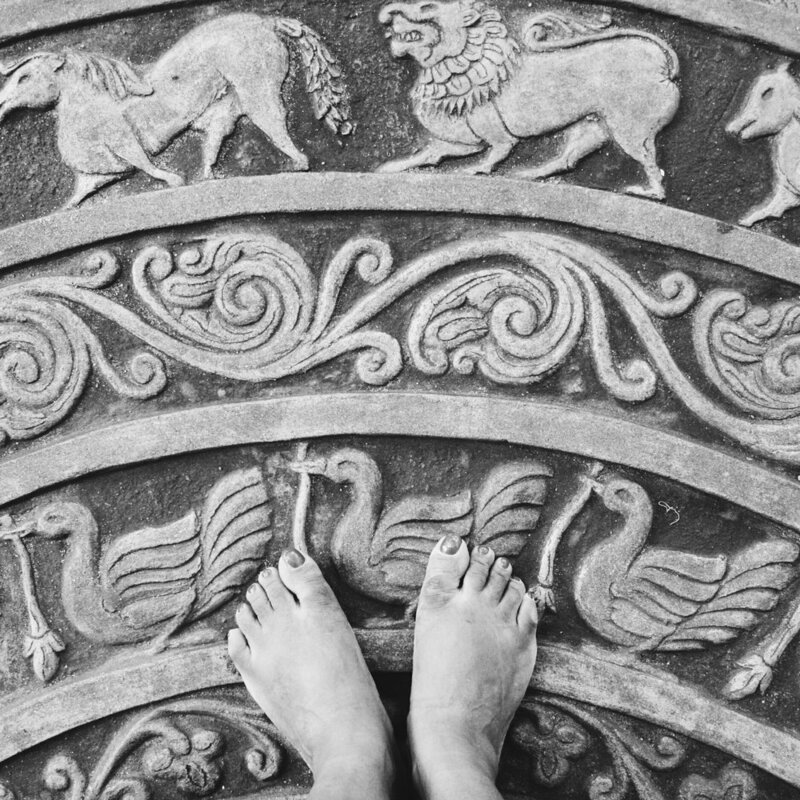 For me, that ceremonious step is this post today with a photo of my feet placed on something uniquely Sri Lankan – a moonstone. You will find this elaborately carved, half-circled stone adorning the entrances of ancient Buddhist temples and buildings in the early kingdom city ruins of Anuradhapura and Polonnaruwa, approx. 4 hours north and 5 hours north-east of the capital city Colombo. For years I was mystified by the beautiful and, beautifully named, moonstone – why was it called that? Where on the stone was the “moon” reference? What else did those ornately curled designs symbolise? Of course, I knew that the moonstone had Buddhist religious significance and for a while I took this too literally and painstakingly pranced around them at temples, believing that they were too sacred to soil. I must have been a sight for sore Sinhalese eyes! I can still imagine those onlookers shaking their heads and muttering kalu suddhi (literally, “black white-girl”) under their breath as they proceeded to walk straight on top of it all. But perhaps this is what happens when you only have a partial understanding of things – they become in equal parts mystical and magical. It begs the question though, what is a moonstone other than another fancy old rock? Originally, I thought that this question would be an easy nut to crack. I mean, Google knows everything, right? However, bitter experience has taught me that research always seems simple until you actually start doing it. Take the unique word “moonstone”. Who would have thought that it’s also a stone with so-called evolution powers in the Pokémon game? Even the phrase “Sri Lankan moonstone” led me down the garden path of gems. Not that I objected of course. Sri Lankan gems are a favourite topic of mine (but more on that in another post so I hope you stick around). In the end, I probably shouldn’t have been astonished to discover that the etymology of that ancient rock known as a moonstone has not one, but two, sources. The earliest source of the word moonstone is derived from the great Sinhalese chronicle, the Mahavamsa (pronounced maha-vum-sa). The Mahavamsa was written around the 5th century CE at the height of one of the Sinhalese golden ages known as the Anuradhapura Period, when the first moonstones were created. In that chronicle, these stones are referred to by their ancient Pali name: patika, which is said to mean a half-moon shaped stone or a semicircular slab at the foot of the staircase. Completely separately to this description, the moonstone is also commonly accepted to be a literal English translation of a later Sinhalese name for it: sandakada pahana, where sanda means “moon” kada means “piece or part” and pahana means “stone”. It is unsurprising that over time an extinct Pali word was surpassed by the Sinhalese vernacular. Even the weeds overtook the cities of Anuradhapura and Polonnaruwa following their decline! However, I found this factual description disappointingly trite because I was imagining, even hoping for, some magic to this little mystery. It turned out in the end that I was just looking too hard for it in the wrong place, amongst the forest of ancient words. After all, what’s in a name? Well the real magic it seems was always there, hiding in plain sight right underneath my feet. It is the intricate and rich artistry of these magnificent moonstones which transforms them from being just another a piece of rock to a venerable object. The concentric bands of half-circles alternate with repeating animal and floral motifs – on one there is a lion, bull, elephant and horse, on another a liya vela (a creeper or vine), on another a hamsa (sacred goose) and at the very centre is the lotus flower. As you might expect, there are almost as many theories for the meanings of these motifs as there are moonstones. Into this cacophony, I want to proffer one which connects this early Sinhalese art with its roots in early Indian art, Buddhism and even the great Buddhist revivalist King Ashoka of India, whose missionaries introduced Buddhism to Sri Lanka early in the Anuradhapura Period. It begins with another piece of rock – the Lion Capital of Ashoka – a glorious 2.15m high sculpture built around 250 BCE by King Ashoka to commemorate the Buddha’s first sermon of the dhamma (his teachings, its practise and its result: enlightenment). If you look at the first photo of it above, you can see four Asiatic lions standing back to back on the top of the capital. But what is relevant to our moonstone is beneath that – carved onto the circular base is a lion, a bull, an elephant and a horse each separated by a chakra (wheel). Archaeological evidence in India and Sri Lanka reveals that those four animals together were used by the ancients to symbolise the Buddha. The other interesting feature directly beneath that base of the Lion Capital is the upturned lotus flower, an almost universally accepted symbol of nirvana (enlightenment). It’s not a stretch to say that the masons who carved the Anuradhapura moonstones a couple of hundred years afterwards would have been acutely aware of these Indian Buddhist symbols and their meanings when they carved those symbols onto the moonstone. The Sinhalese were after all becoming the self-appointed guardians of Buddhism following the demise of the Ashokan Empire. Which leads me to the hamsa, a ubiquitous motif in both Indian and Sinhalese art. Those masons would have known this sacred goose to be a sign of wisdom in Indian mythology and that in Hinduism the flight of the hamsa signified freedom from samsara (the cycle of death and rebirth). Framing this are the half-circles of the liya vela – an otherwise rambling plant whose decorative exuberance conveys growth in early Indian art. What struck me was that those early Sinhalese masons were clever and imaginative artisans and designers. They etched out of rock a semi-circle narrative to pay homage to a Buddhist site, using the symbolism of their closest neighbours with whom they shared an inextricably linked past. But those masons did not slavishly adhere to the Indian way of doing things. Like Sinatra, they did it their own way – by fashioning the moonstone’s unique layout, adapting age-old designs (the lotus petals are truncated, the liya vela have a more logical form to Indian examples) and giving functionality (yes, you could tread on it!) to a thing of reverence. The moonstone is a testimony to the confidence and creativity of a civilisation in its prime. As for me, I confess that the real reason I took that photo that day was that I love the feel of that distinctively Sri Lankan stone beneath my feet, weathered by hundreds of thousands of other feet all on their own pilgrimage. A serendipitous moment, you could say, to take the first step of my own journey.